Standard armament of Su-15 consisted of two R-98 missiles carried on the outer wing pylons, one IR-guided and one radar guided variant. Initially the Su-15 carried also the older R-8M variants. 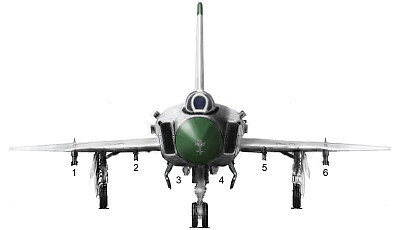 The two IR-guided R-60s on inner wingpylons became standard on all Su-15 armed variants from 1973 onwards. The Su-15TM with Taifun-M radar was armed with two modernised R-98M missiles, two R-60 and underbelly gunpack consisting of two UPK-23-250 gun pods. * inner-wing pylons were fitted to existing and new-build Su-15 from 1973 onwards. ** only Su-15TM with PU-2-8 (wing) and BD3-59FK (fuselage) pylons, A-G only in theory because of lack fire control system. *** only with Taifun-M radar, all production Su-15TM. **** R-55 (AA-1) unconfirmed, but can be seen on Su-15 monument in Rzhev, Russia.